Some of my favorite memories growing up were playing in my mama’s Tupperware cabinet. It was actually a 1920’s Hoosier Cabinet, but it was affectionately known as “Mama’s Tupperware Cabinet.” I could pull all the Tupperware out and stack it, match the lids, spread it out all across the kitchen floor. The burnt orange, mustard yellow, and olive-green storage bowls with their ridged lids were like a treasure trove for a little blonde headed girl with a vivid imagination. I remember having the cabinet doors swung wide open, with little ramekin sized containers flipped upside down serving as “seats” around a salad bowl with its corresponding lid on it serving as a “dining table” while having an imaginary tea party with my Barbie Dolls. As I got older, I knew that if I needed a little container for my hairbows or bobby pins, or a parfait cup for a pencil holder, I could always turn to Mama’s Tupperware Cabinet. I had a great childhood. My mom harvested our creativity by letting us play in the Tupperware cabinet, and instilled a value in all of us that family and our origins are important. In addition to having a great mom, I had a Nannie who was my absolute best friend. I was the only granddaughter and the oldest of her grandkids, so to say that we were close is an understatement. She would come get me on Saturdays in her red convertible, let me ride shotgun, and hold the classified section of the newspaper that was covered in circles of all the yard and antique sales that we were going to check out that day. If we happened to pass an unadvertised sale, my Nannie would literally slam on the brakes in the middle of the road and turn around to see what they had to offer. When the weather was bad, or the classified section let us down, we would go to the local consignment stores and antique shops to hunt for bargains there. I loved finding “cool kid” clothes and toys but as I got older, I began to love the “hunt” of finding different trinkets to decorate my room and to turn into something completely different than for what it was intended. I found a copy of Walt Disney’s 1964 Original Mary Poppins Soundtrack on vinyl on one particular hunt and brought it home. I baked it in the oven over top of a stainless-steel bowl, creating a bowl that I used on my console table in the entryway of my college apartment. Those shopping trips with my Nannie were the highlight of my week as a kid and still one of my fondest childhood memories. In the last 12 years I have lived all over the country, given how close we all are, I often got (and still get) homesick. When I do, I find a funky consignment store, an antique shop, or sometimes just a good old-fashioned yard sale and I let the nostalgia and bargain hunting begin. I sincerely enjoy hunting for funky pieces that remind me of Mama’s House and then researching to uncover their history. One afternoon while visiting Mama, the topic of the tupperware cabinet came up. I had no idea what a Hoosier Cabinet actually was. It was one of my Nannie’s parents first purchases when they were making their home. This cabinet dates back to the 1920’s and aside from one piece of trim board that came off in a move about forty years ago, it is in its original condition. I knew I loved that Tupperware cabinet all throughout my childhood, but to know its rich history, my love for this golden oak colored cabinet, with the flour sifter that made a scratchy sound when you turned the handle, only magnified. When I moved back to the continental United States, my mama gave me the Hoosier Cabinet. I was over the moon! I had the World’s Greatest Tupperware Cabinet! I didn’t even own real Tupperware, but I quickly hit up the thrift stores and antique malls in search of my very own vintage containers, so I had some to put in my beautiful “new” cabinet! When I got it to my new house, I put all my cookbooks in the top shelves… I only had three, but I bought some more of those too! I then sat down on the floor, took a deep breath and almost ceremoniously swung those cabinet doors open, and one by one arranged my new collection ever so carefully inside. As I unpacked my Tupperware, I couldn’t help but shed a few tears because this piece of kitchen cabinetry had been in my Great Nannie’s Kitchen, my Nannie’s Kitchen, my Mama’s Kitchen, and now it was sitting in mine. I had to wipe those tears away because I had other furniture to settle into my new home. My mama also saved the desk and hope chest from my childhood and gave it to me. While the desk had seen better days, I couldn’t bring myself to refinish it. Something about seeing that nail polish on my desk-turned-vanity brings me a smile every time I sit down to put my makeup on. The Hope Chest has been repurposed to a toy box and window seat which is currently showing off its strength against my two rambunctious boys. When we moved to Virginia, we had to greatly downsize. My options were to store it in a basement or to give it back to my mama to “cabinet sit” for me on a long-term basis. This cabinet is too beautiful and in too great of a condition to leave sitting in a basement collecting dust, so my Mama took it back to her house. She is no longer storing Tupperware there. The only place in my parent’s home that this cabinet would fit without being bumped, scratched or being in the way was in their entry hall by the front door. 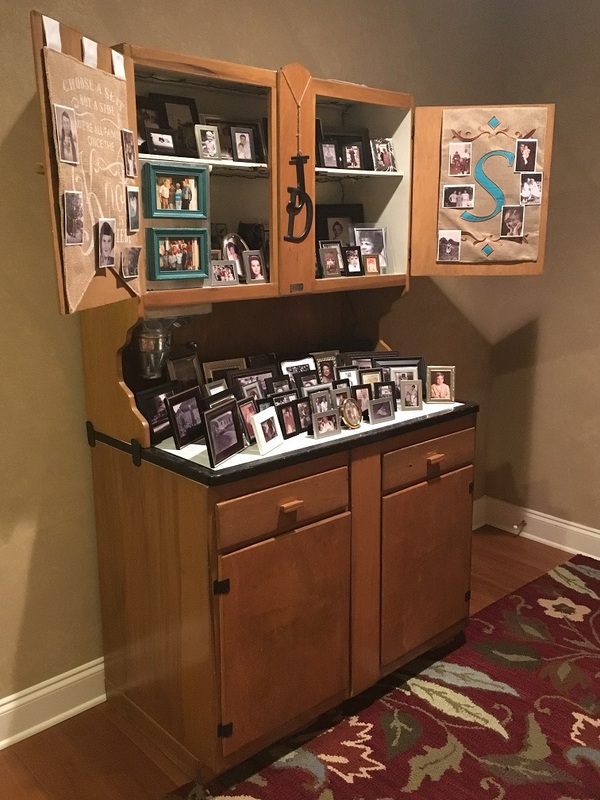 So, my Mama, being the creative genius that she is, swung those top cabinet doors open permanently, put two garden flags on the inside of the doors, and filled that cabinet up with hundreds of photos of our Great and Great Great Nannies and Papaws, cousins, uncles and aunts. One of the flags talks about blending families and the other is a monogram (this is the south, after all!) and the frames are all mismatched in color, size and shape. Some photos have lost all of their color and others are fading fast but this antique cabinet that holds so much heritage has officially found its perfect repurpose in the entryway to my Mama’s house, reminding all of us where we come from and that when all else fails, all roads lead back home. It was this cabinet that sparked my interest in all things vintage, old, and unique. Because of it and my Mama and Nannie, I am always intrigued by resale stores, and I may or may not have slammed on the brakes and made a u-turn for an antique or consignment store a time or two. I can spend hours looking through stores, seeking the perfect piece to keep in its original state or more often than not, repurpose into something completely different. I enjoy checking these places out when we travel looking for cool pieces with history to bring back home to commemorate our experiences. I like knowing that our area is rich with antique and consignment stores as well as pop up sales such as yard sales and auctions. It is nice to be able to go shop these places with my kids, or even alone when I find a few hours to myself. Personally, I prefer to buy things, such as furniture, clothes, and decor used from resale stores. Many of these stores check out their potential merchandise thoroughly before it hits their sales floor, so I can be confident that the pieces that I do purchase are in good shape, made by a reputable manufacturer and are of a great quality. It saves me money and makes life a lot easier because I can still have nice clothes, have a beautifully decorated home and quality furniture that will last a long time without going broke to have done so. 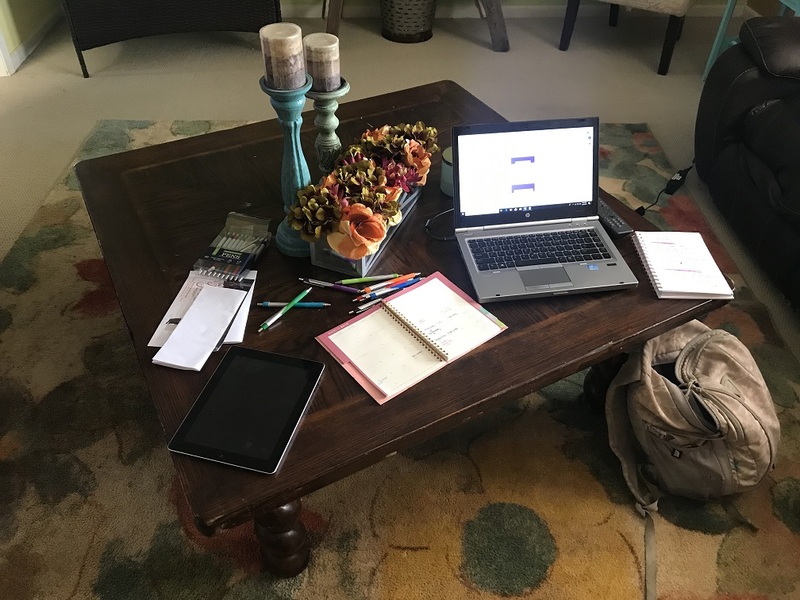 As I sit here on my living room floor typing this on my coffee table, I can’t help but reminisce and think that my Mama’s Tupperware cabinet sparked some sort of passion and interest that truly has become a family affair. This coffee table used to be a dining room table. My Daddy cut the legs down on it to make it coffee table height. Now, I have a giant coffee table where my family can sit around and play games, watch movies, do homework and most importantly, create memories. It is because of that Tupperware Cabinet that I have a passion to find fun and unique stuff to make my own, and that I have a desire to find those pieces for my kids that stir nostalgia for them as that cabinet has for me. Candace is the proud owner of Sweet Cee’s Gifts and Kids Consignment, located in the heart of South Boston, Virginia, where she lives with her husband and business partner, Nelson Baskervill and two children, Casper and Duke. For information about Sweet Cee’s, please visit www.facebook.com/sweetcees.